Pump-up your classroom or existing online training by adding Interactive Videos from our library! 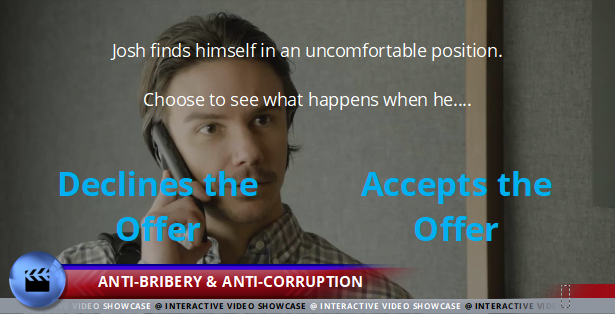 One of the ways Traliant creates impactful training is through the use of Interactive Videos. With Interactive Videos, the user becomes an active participant in the training rather than a detached viewer. Studies shows that when the learning material actively engages users they are more likely to allow the material to influence their future behavior. It is for this reason Traliant is continually building new, dynamic interactive videos for use in courses and for clients to use independently. While all the videos in the Compliance Training Video Library are used in one or more of Traliant’s courses, we also make the entire library available on a subscription basis for clients to use in a variety of ways. 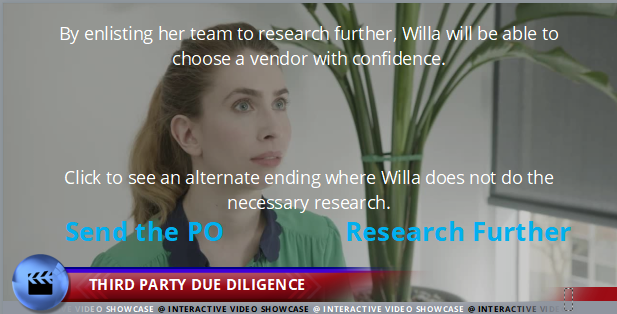 First, clients use these interactive videos in their own classroom training where they want to enhance existing presentation with new and engaging material. Clients also use these videos on internal web sites within their policy pages bringing to life important cultural and regulatory issues. Please take a moment and review the descriptions of each Interactive video below, if you would like to evaluate the entire library of Interactive compliance videos, simply fill out the form to the right. This video features an example of unintentional age discrimination by otherwise well-meaning managers. 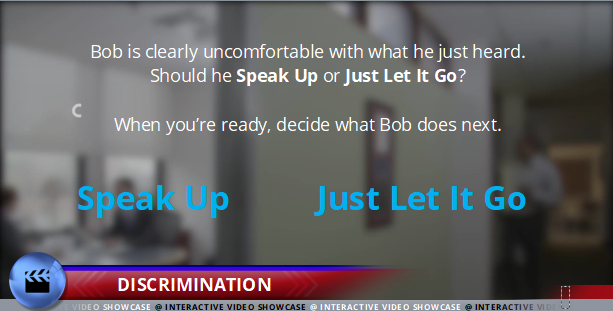 An associate observes a conversation about a discriminatory decision and then is faced with the hard choice of whether to Speak Up or Let It Go. 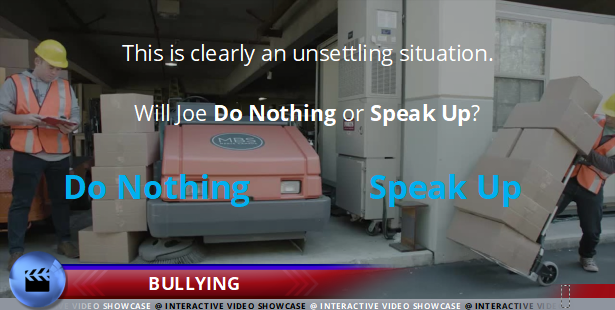 This video illustrates how casually a discriminatory decision can be made, and then underscores the importance of speaking up when improper behavior is observed. This video shows a sales executive, Nikki, being subjected to two kinds of sexual harassment - Hostile Work Environment and Quid Pro Quo. The learner sees how Nikki responds to each type of harassment. This video not only illustrates the important differences between these two types of sexual harassment, it also shows how a victim can professionally and respectfully respond to inappropriate behavior. The video sequence is comprised of five scenes. Each starts by demonstrating a person getting a workplace interaction wrong -- and crossing the line into harassment or bullying. Then, after a fast rewind, the person gets a second chance - and gets the behavior right. Learners see how to handle everyday workplace interactions respectfully. In this video, an employee is subjected to abusive behavior from a supervisor. The learner sees how such behavior can negatively affect not only the target, but others in the workplace, too. 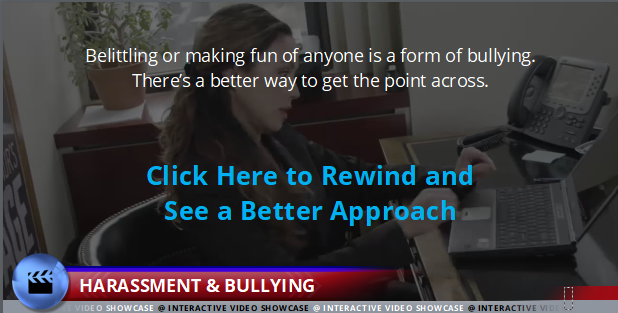 The video teaches that the way to stop a bullying situation is for the target or a bystander to speak up, either to the bully directly or to HR. A positive attitude is contagious! This video follows two colleagues - one with a more positive, inclusive outlook than the other -- throughout a work day. When the video pauses mid-conversation, their private thoughts are revealed. The learner is asked to choose the inclusive way of thinking - and then watches as one positive response leads to another, which can spread positivity throughout the workplace. 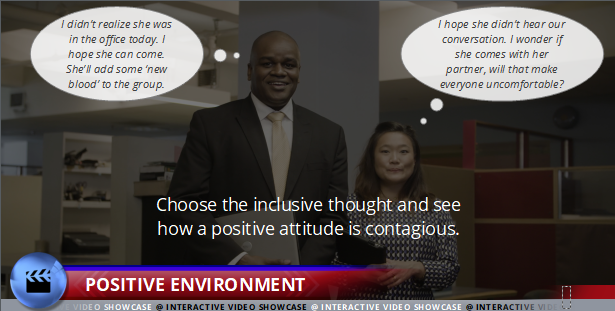 In this video employees are asked to discuss what diversity brings to an organization. Their answers, which cover a range of benefits affecting many areas of an organization, are followed up with on-screen text that provides further explanation. 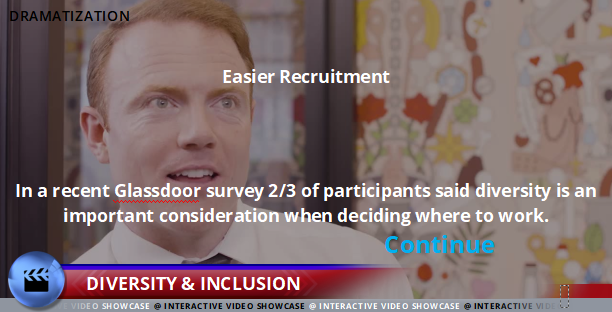 This video takes the learner through an HR investigation into a discrimination claim. Borrowing from the filming style of the popular series “House of Cards,” the HR manager frequently turns to the camera and speaks directly to the learner. 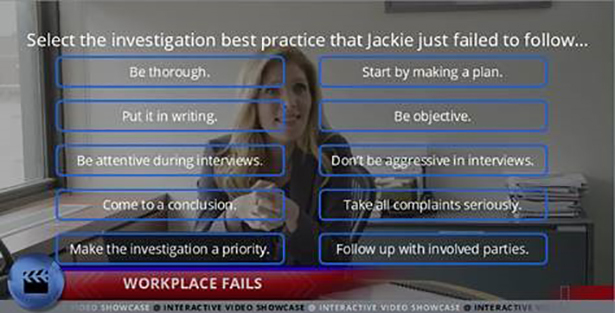 The video pauses at key points along the way so the learner can identify “fails” in the investigation. A manager is unexpectedly put in an awkward position when he is asked to give an employee a promotion in exchange for a contract. The learner sees the manager handle the uncomfortable situation two different ways, one that results in a negative conclusion. A sales representative is asked by a competitor to divide a geographic territory, which seems like a good idea at first. The learner then views two endings - one where the sales representative checks before proceeding, and another where she goes ahead with the plan, and later faces the consequences. An individual at a party overhears a conversation about a booming business. 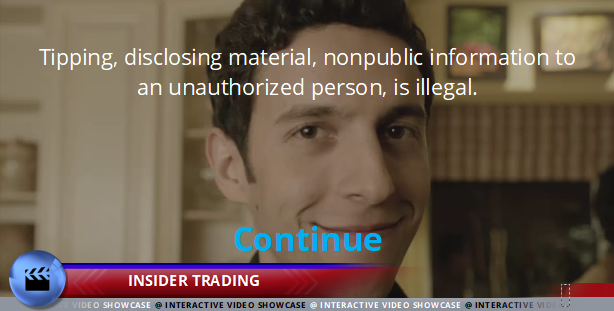 In the series of events that follow, his actions cross the line into illegal insider trading. As the learner moves through the video sequence, numerous violations of insider training laws are illustrated. 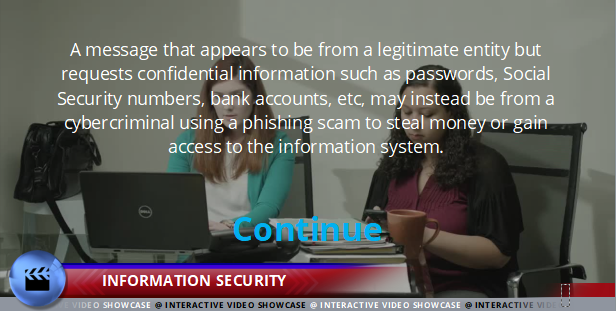 This video takes the learner through four different scenarios, each illustrating a common mistake employees make that can compromise the security of their organization’s information system. After each scenario, the learner is provided an explanation of how the misstep enables scammers and saboteurs to gain unauthorized access. 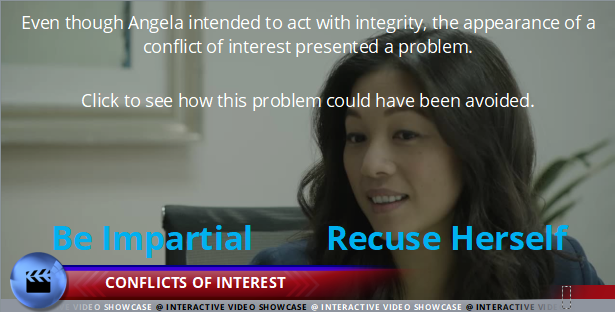 An employee with honest intentions is asked to consider whether she has a conflict of interest. The learner views two endings and sees that even when someone vows to be impartial, if there is even an appearance of a conflict of interest, things can backfire. A purchasing manager faced with an approaching deadline must decide whether to buy from a vendor with a blemished record, or do more research to find a better option. The learner views alternate endings and sees both the negative outcome of cutting corners, as well as a sensible way to solve the time-crunch problem. An employee finds himself in a sticky situation when a colleague asks for help in sending an email to people who have opted out of the company’s mailing list. In this video, the learner views three endings. Two show negative outcomes, while the third shows that getting guidance from leadership can sometimes be the best way to handle a sensitive situation. Experience Traliant’s Courses that allow customization of both text and video …. delivered at off-the-shelf prices.